A stepwise and careful history helps identify the many causes of vertigo and dizziness. In the next issue, Part 2 covers the oculomotor and vestibular examinations. In 2009, the Barany Society published the first consensus classification of vestibular symptoms. Internal vertigo is a false or distorted sensation of self-motion including spinning, swaying, bobbing, tilting, bouncing, and sliding. External vertigo is a false or distorted sensation of the surroundings, excluding bidirectional motion, which is known as oscillopsia. The feeling of being unstable without a particular direction preference while sitting, standing, or walking is unsteadiness. Dizziness is a nonmotion sensation of disrupted spatial orientation. Purposefully, the definitions do not suggest a particular disease pathophysiology.1 Orthostatic hypotension and benign paroxysmal positional vertigo (BPPV), for instance, can both induce vertigo or dizziness,2,3 although the term vertigo will be used throughout this article to describe either symptom. Patients may have more than a single symptom at a time. For example, a common combination of symptoms in vestibular neuritis includes vertigo (due to semicircular canal imbalance) and oscillopsia (due to horizontal jerk nystagmus). Patients may also have symptoms that transition from one to another over time; for example, acute vertigo to chronic unsteadiness. In some vestibular disorders (eg, vestibular paroxysmia), patients have directionally specific spinning that may be better recognized in vertigo than in external vertigo.4 Spinning vertigo that changes direction during a single event, is unique to Ménière’s disease and related to the phases of the attack—excitatory, inhibitory, or recovery.5 Understanding the direction of vertigo can occasionally help lateralize the disorder or better understand the pathophysiology. Vertigo spells are brief, usually lasting seconds in patients with BPPV, vestibular paroxysmia, and cardiac arrhythmias. Patients with Ménière’s disease, vestibular migraine (VM), or transient ischemic attacks (TIAs) often present with vertigo spells lasting minutes to hours. In patients with with vestibular neuritis or central vestibular lesions from stroke or demyelination, vertigo lasts days to weeks. Patients with bilateral vestibular loss (BVL), uncompensated unilateral vestibular loss (UVL), chronic intoxication, or persistent postural perceptual dizziness (PPPD) often have months to years of symptoms. Vestibular disorders can be grouped by presentation into acute, episodic, and chronic vestibular syndromes (AVS, EVS, and CVS, respectively). Patients with AVS present with more than 24 hours of continuous vertigo (lasting days to weeks and monophasic) with nausea/vomiting, imbalance, head motion intolerance, spontaneous nystagmus (eg, stroke or vestibular neuritis). Patients with EVS have similar symptoms and signs as AVS, lasting seconds to hours (eg, Ménière’s disease, VM). Patients with CVS have constant vestibular symptoms for weeks to years (eg, bilateral vestibular loss). Figure 1. 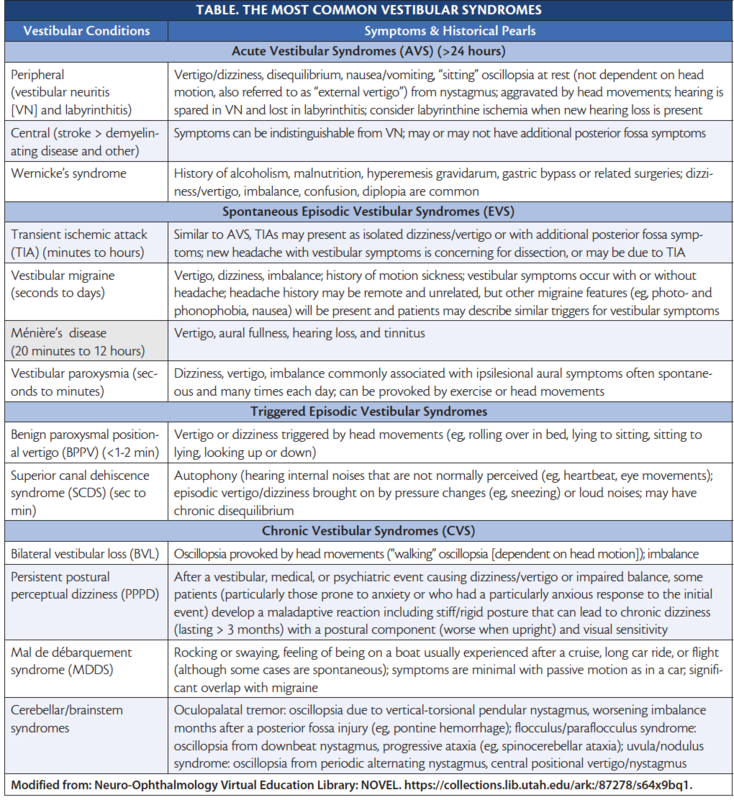 Acute vestibular syndromes (AVS). Note: HINTS Plus is a mnemonic for head impulse, nystagmus, test for skew, plus new unilateral hearing loss. Figure 2. 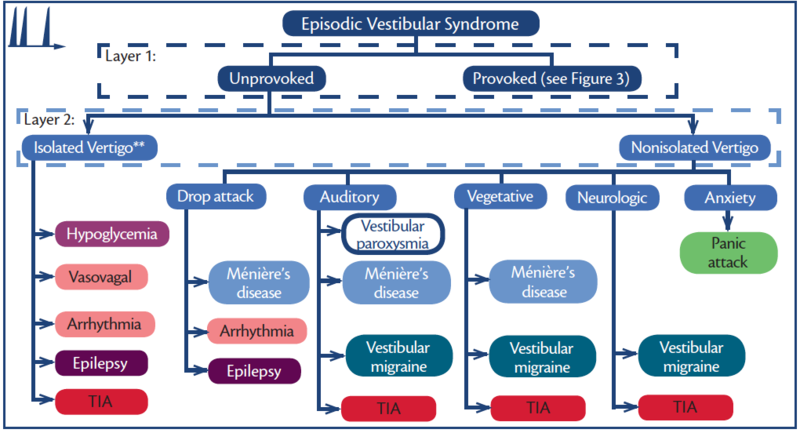 Episodic vestibular syndromes (EVS)—unprovoked. **Each of these disorders may or may not be isolated (eg, aura is common in seizure and diaphoresis in hypoglycemia.) Abbreviation: TIA, transient ischemic attack. Figure 3. Episodic vestibular syndromes (EVS)—provoked. * Visual vertigo following any vestibular disorder. Abbreviations: BPPV, benign paroxysmal positional vertigo; SCDS, superior canal dehiscence syndrome. Figure 4. 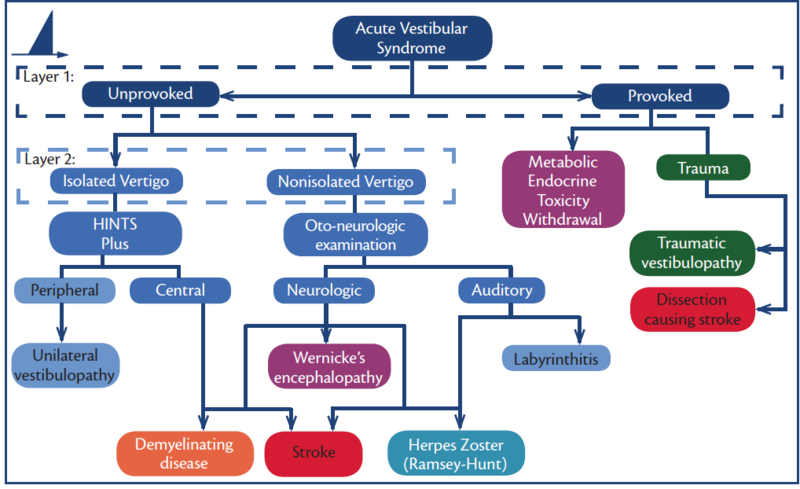 Chronic vestibular syndromes and overlapping/evolving syndromes. Abbreviations: AVS, acute vestibular syndrome; BPPV, benign paroxysmal positional vertigo, CVS, chronic vestibular syndrome; EVS, episodic vestibular syndrome; PPPD, persistent postural perceptual dizziness; TIA, transient ischemic attack; VM, vestibular migraine. 1. First Layer: Are symptoms provoked or unprovoked? 2. Second Layer: Do vestibular symptoms occur in isolation or are there additional neurologic or audiologic symptoms? Head Motion. In a patient with a vestibular disorder (peripheral or central), a normal head movement can lead to a faulty estimation of movement. Symptoms are experienced during or time-locked with the head movement. Position. Attacks of vertigo and dizziness in patients with BPPV or central positional nystagmus occur in response to changes in the gravitational vector during movements such as looking down-then-up, bending over, or rolling over in bed. Symptoms are triggered by the head movement. Orthostatic Change. Triggered by changing from a seated to standing position or from lying to seated, orthostatic vertigo and may be related to a neurologic condition (eg, multiple system atrophy), medications (eg, antihypertensives), hypovolemia, or presyncope. If symptoms are triggered by standing up from sitting when there is no change in spatial orientation of the head with respect to gravity (eg, standing from a chair without moving the head), orthostatic hypotension is favored. Symptoms triggered by going from sitting to lying or rolling over in bed (both cause a change in gravitational vector), in contrast, favor BPPV. Exertion. Exertion-related vertigo may be caused simply by activities leading to head movements that trigger positional or head motion-induced symptoms. If vertigo occurs with exertion when the head is stationary, however, cardiopulmonary disorders should be considered. Additionally, hyperventilation and changes in cerebrospinal fluid (CSF) pH that occur with strenuous activity may also lead to 8th cranial nerve hyperexcitability in vestibular paroxysmia or with acoustic neuroma. Eye Position. A particular eye position may bring on symptoms. For example, monocular oscillopsia can be induced by down and medial gaze in superior oblique myokymia. Patients with a third-window syndrome (superior canal dehiscence syndrome [SCDS], perilymph fistula, or enlarged vestibular aqueduct syndrome) have inner ear bony structure deficits. Changes in intracranial or middle ear pressure or loud sound (Tulio phenomenon) often lead to inappropriate excitation or inhibition of a semicircular canal, causing vertigo and nystagmus. In SCDS, excitatory stimuli for the anterior (also known as superior) canal include Valsalva against pinched nostrils (eg, blowing the nose), positive pressure in the external auditory canal (EAC) (eg, inserting a wet finger into the EAC) or a loud sound. The resultant nystagmus will be downbeat-torsional (top poles beating toward the affected ear). Inhibitory stimuli include Valsalva against a closed glottis (eg, heavy objects lifting, coughing, straining, and laughing) or negative pressure in the EAC (eg, pulling out a wet finger from the EAC). The resultant nystagmus will be upbeat-torsional (top poles beating toward the unaffected ear).9 A history of head trauma including barotrauma and blast injury is a known risk factor.10 In comparison to patients with third-window syndromes, vertigo spells in Chiari malformation or situational and vasovagal syncope may be driven by closed-glottis Valsalva maneuvers but are not triggered by loud sound or middle ear pressure changes. Understanding that normal balance relies upon visual, proprioceptive, and vestibular inputs can help the clinician establish which system(s) are impaired depending on the specific condition(s) that worsen balance. Asking about situations with down-regulation of visual cues (walking in the dark) and disrupted somatosensory cues (walking on uneven surfaces) can have localizing value. When it’s not clear whether a patient with acute prolonged or episodic symptoms has a vestibular or nonvestibular etiology, the presence of vegetative symptoms suggest a vestibular disorder. Nonischemic auditory symptoms. Clinically, labyrinthitis resembles vestibular neuritis but can be differentiated by the presence of acute unilateral hearing loss. In patients with acute or chronic middle ear infection or meningitis, abrupt audiovestibular symptoms are concerning for bacterial labyrinthitis. Abrupt-onset audiovestibular symptoms with ipsilesional peripheral facial paresis and vesicular rash (may involve the auricle, EAC, and tympanic membrane) is concerning for herpes zoster (Ramsay-Hunt syndrome). Neurologic symptoms of diplopia, dysarthria, numbness, weakness, hiccups, vision loss, or clouded consciousness should be assessed. Although stroke is the most common cause of central AVS, multiple sclerosis and Wernicke’s encephalopathy also should be considered. Inflammatory disorders (eg, granulomatosis with polyangiitis, lupus erythematosus, or sarcoidosis) and infectious diseases (eg, tuberculosis, fungal infection, or syphilis) are often subacute and may present as focal (inflammatory infiltrate or abscess) or diffuse (multiple cranial neuropathy) neurologic deficits. Autoimmune encephalitis (paraneoplastic or non-paraneoplastic) also has a subacute temporal profile. Anxiety is a common comorbidity of all vestibular disorders and may adversely influence recovery. Of note, spells of dizziness or vertigo may result from a panic attack, agoraphobia, traumatic stress disorders, or generalized anxiety. Patients with anxiety-related dizziness are less likely to report external vertigo or significant vegetative symptoms. By approaching the vestibular history methodically, an accurate diagnosis can usually be made, or the differential diagnosis at least narrowed substantially. Using symptom type alone to diagnose dizzy or vertiginous patients is an ineffective approach and often leads to the wrong diagnosis and inappropriate testing. Once timing and triggers are understood, categorization into acute, episodic, or chronic vestibular syndromes can be done and a targeted exam chosen. That examination will then confirm the diagnosis and/or inform further audiovestibular testing or neuroimaging. 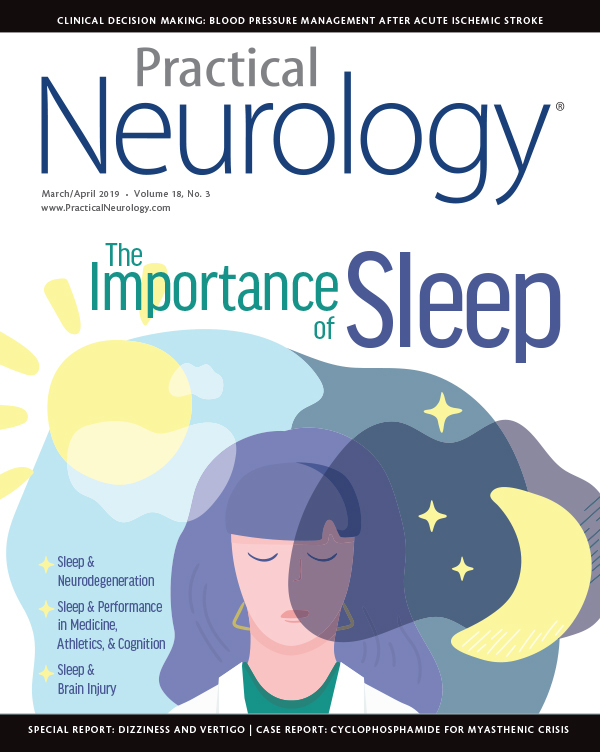 The approach to the vestibular and ocular motor examination will be discussed in Part 2 in the next issue of Practical Neurology. 1. Bisdorff A, Von Brevern M, Lempert T, Newman-Toker DE. Classification of vestibular symptoms: towards an international classification of vestibular disorders. J Vestib Res. 2009;19(1-2):1-13. 2. Choi JH, Seo JD, Kim MJ, et al. Vertigo and nystagmus in orthostatic hypotension. Eur J Neurol. 2015;22(4):648-655. 3. Von Brevern M, Bertholon P, Brandt T, et al. Benign paroxysmal positional vertigo: diagnostic criteria. J Vestib Res. 2015;25(3-4):105-117. 4. Strupp M, Lopez-Escamez JA, Kim JS, et al. Vestibular paroxysmia: diagnostic criteria. J Vestib Res. 2016;26(5-6):409-415. 5. Lopez-Escamez JA, Carey J, Chung WH, et al. Diagnostic criteria for Menière’s disease. J Vestib Res. 2015;25(1):1-7. 6. Bronstein AM, Lempert T. Symptoms and syndromes in the patient with dizziness or unsteadiness. In Bronstein AM (ed): Oxford Textbook of Vertigo and Imbalance. Oxford, United Kingdom: Oxford University Press; 2013: 354. 7. Bisdorff A. Vestibular symptoms and history taking. Handb Clin Neurol. 2016;137:83-90. 8. Edlow JA, Newman-Toker DE, Savitz SI. Diagnosis and initial management of cerebellar infarction. Lancet Neurol. 2008;7(10):951-964. 9. Ward BK, Carey JP, Minor LB. Superior canal dehiscence syndrome: lessons from the first 20 years. Front Neurol. 2017;8:177. 10. Minor LB. Labyrinthine fistulae: pathobiology and management. Curr Opin Otolaryngol Head Neck Surg. 2003;11(5):340-346. 11. Staab JP, Eckhardt-Henn A, Horii A, et al. Diagnostic criteria for persistent postural-perceptual dizziness (PPPD): consensus document of the Committee for the Classification of Vestibular Disorders of the Bárány Society. J Vestib Res. 2017;27(4):191-208. 12. Strupp M, Kim JS, Murofushi T, et al. Bilateral vestibulopathy: diagnostic criteria consensus document of the Classification Committee of the Bárány Society. J Vestib Res. 2017;27(4):177-189. 13. Cousins S, Kaski D, Cutfield N, et al. Predictors of clinical recovery from vestibular neuritis: a prospective study. Ann Clin Transl Neurol. 2017;4(5):340-346. 14. Choi KD, Lee H, Kim JS. Ischemic syndromes causing dizziness and vertigo. Handb Clin Neurol. 2016;137:317-40. 15. Lees KA, Tombers NM, Link MJ, et al. Natural history of sporadic vestibular schwannoma: a volumetric study of tumor growth. Otolaryngol Head Neck Surg. 2018;159(3):535-542. 16. West N, Sass H, Møller MN, Cayé-Thomasen P. Facial nerve schwannomas presenting with vestibular dysfunction: a case series. Acta Neurochir (Wien). 2018;160(12):2315-2319. 17. Gluth MB, Baratz KH, Matteson EL, Driscoll CL. Cogan syndrome: a retrospective review of 60 patients throughout a half century. Mayo Clin Proc. 2006;81(4):483-488. 18. Girasoli L, Cazzador D, Padoan R, et al. Update on vertigo in autoimmune disorders, from diagnosis to treatment. J Immunol Res. 2018;2018:5072582. 19. Lempert T, Olesen J, Furman J, et al. Vestibular migraine: diagnostic criteria. J Vestib Res. 2012;22(4):167-172. 20. Choi JH, Oh EH, Park MG, et al. Early MRI-negative posterior circulation stroke presenting as acute dizziness. J Neurol. 2018;265(12):2993-3000. 21. Grad A, Baloh RW. Vertigo of vascular origin. Clinical and electronystagmographic features in 84 cases. Arch Neurol. 1989;46(3):281-284. 22. Kattah JC. Use of HINTS in the acute vestibular syndrome. an overview. Stroke Vasc Neurol. 2018;3(4):190-196. The authors have no financial or other relationships relevant to this content to disclose.